Pastors need to think more like fundraisers while keeping their churches focused on their missions. 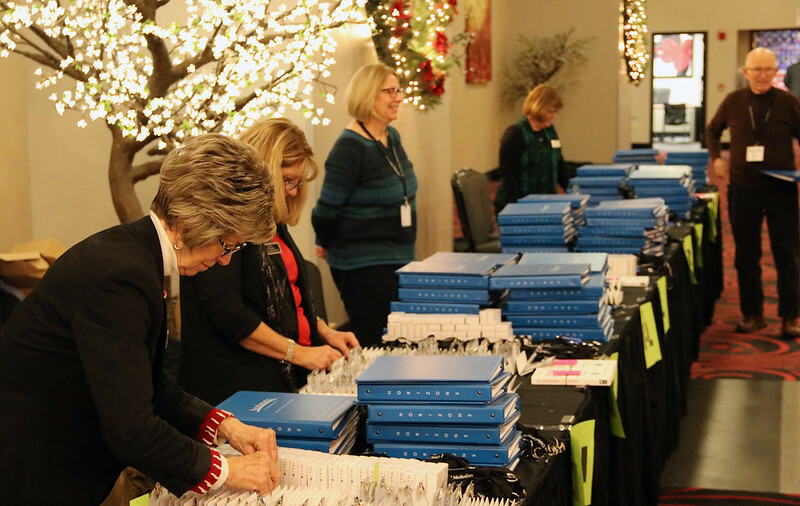 That was the overriding theme of the 2018 Orders & Fellowship meeting, Jan. 17-19 at Younes Conference Center in Kearney. Two nationally recognized experts on fundraising from Horizons Stewardship – Horizons founder, the Rev. Dr. Clif Christopher, and the Rev. Dr. Mike Slaughter, who recently retired after 38 years with Ohio’s Ginghamsburg United Methodist Church – challenged the approximately 550 clergy in attendance to think better financially, both by what they share from the pulpit and in how they relate to their parishioners. Churches, both Christopher and Slaughter said, face more of a challenge than ever as they compete for dollars with colleges, hospitals and other nonprofit charities. Christopher challenged the long-held philosophy that pastors should not see who in their congregation contributes financially to their churches and how much. He said many congregations have put rules in place to prevent the pastor from knowing such information. Likewise, both said, churches should eliminate the “little black box” in the bulletin with year-to-date giving and how far the church is behind in its annual budget. Christopher said that practice makes the church look like it’s failing, and it paints a false picture in many cases because giving is almost never evenly spread out between the 12 months of the year. It can be quite normal, he said, for a church to be behind in its yearlong budget until December. In a presentation titled “The Heart of the Matter,” Slaughter said that he preached on stewardship at Ginghamsburg – which grew from 90 members to one of the largest United Methodist churches in the country during his time there – all year long. Sixteen of Jesus’ 38 parables, he pointed out, were about money and possessions. Attendance at Ginghamsburg, he said, far exceeds membership because individuals cannot become members until they tithe. While all people who attend worship are welcome, members go through classes to understand the significance of making such a commitment. Members are taught that sacrificial living “defines our character to God,” Slaughter said. “We’re the only bank account Jesus has,” he added. The church has four separate nonprofits under its umbrella, including its food pantry, so it can receive government funding, Slaughter said. It also includes a variety of programs that are financially supported by church members. In a presentation titled “Prepare to Compete,” Christopher discussed strategies for approaching donors versus other nonprofits. Those asking for funds, he said, should not disparage any of their competition. “Forget the negativity and tell how you change lives,” Christopher said. He cited the excellent work done by St. Jude’s Children’s Hospital, which tells compelling stories about families whose lives are changed by the ground-breaking work done in the medical facility. He emphasized the importance of giving in his own church, where members must tithe. “To us, membership in the church is the equivalent of ordination for lay folks,” he said. To keep getting financial support, he said, churches must “measure results and not just activity.” Pastors must lead the way by setting a vision, and laity must be willing to work to make the vision into a reality. “People commit to compelling visions, not church programs,” Slaughter said. He said a compelling vision has four characteristics: They are clear, show urgency, communicate importance and illustrate size. People will buy into a compelling vision, he said. In a presentation titled “Preaching on Faith and Money,” Slaughter said, a prevailing myth is that “people stay away from church because we talk too much about money,” yet fans of TV series such as “Shark Tank,” “The Bottom Line” and “The Profit” don’t mind finances being the subject of discussion. In research for his book “The Christian Wallet,” Slaughter said he discovered that about two-thirds of Americans have some sort of debt other than mortgages. Sixty-three percent have car payments, a little over half have student loans, and 54 percent carry credit card debt, many in significant amounts. Slaughter’s research showed that 30 percent of families surveyed were $10,000 to $50,000 in debt. A budget, he said, should be seen as a “moral document,” asking why money was being spent, whose money was being spent and what God’s priorities were in their spending. He also suggested eight “money drains” for budgets, including daily coffee trips, premium cable television, unused gym memberships, ATM fees, unhealthy habits, credit card interest and unused gift cards. During a presentation titled “Minister as Financial Leader,” Slaughter said pastors should get their own finances in shape before preaching and teaching about the subject. All of the financial leaders in church should set an example by tithing, Slaughter said. “If they’re not tithing, we infect people with our spiritual DNA,” he said. At Ginghamsburg, he said, “committees” are not in place because it suggests “control and command for the pastor.” Rather, the concept of “teams” is in place. In a presentation titled “Fundraising Principles,” Christopher said churches must be operated like other nonprofit organizations. “At the very least, you say ‘Let us take up the offering,’” Christopher added. For new pastors, Christopher said, fundraising, especially for capital campaigns, means intentionally going out to meet the VIPs in the community even before the “ask” is made. “You have got to make friends before you can start raising funds,” he said. Those not closely connected to the church look at giving as an “investment to which they expect a return,” Christopher said. Forming the narrative so people understand that the church is changing lives for the better is a key part of the process. Any request should anchor on the church’s mission, Christopher said. And they should be realistic yet bold. “We serve a God who is always challenging us to be far more than we are today,” he said. “Don’t mess around,” Christopher said. In a presentation titled “Keys to Successful Capital Campaigns,” Christopher said there’s been a “huge upswing” in fund drives to retire debt. “I don’t know anything with the power debt has to kill a church,” he said. Christopher said churches should beware of professional fund-raisers who seek to keep a percentage of the money raised. Instead, he said, seek out companies that charge a flat fee. A consultant could end up charging anywhere from one-half of a percent to 5 percent of all the funds raised. “It’s a very small amount compared to your overall project,” Christopher said. A consultant should be hired unless the pastor has vast amounts of fundraising experience, he added. “If you want to pastor to focus on his or her strengths, you’d better get some help,” Christopher said, noting that the pastor has to help in a major fund-raising campaign but can focus on preaching, teaching and congregational care if a consultant is brought in to help raise money. He also said it was important for the message to be consistent that everyone shares in the task but not everyone gives an equal amount of money. In a final presentation titled “Planned Giving,” Christopher said this kind of giving accounted for more than $30 billion in 2016, adding that figures show 10,000 people turning 65 every day – 3.6 million a year – and that bequests in wills have become an increasingly favored way of contributing. “You’re planting trees that somebody else is gonna sit in the shade of,” Christopher said. Christopher recommended churches employ year-round efforts to educate parishioners of how they can tithe their estates upon their deaths. Thought it may be years or even decades before such actions benefit the church, the seeds can be planted for a movement that results in substantial funds coming to the church. He highly suggested pastors reach out to the Nebraska United Methodist Foundation and the Kansas Area United Methodist Foundation for assistance in developing policies for endowments and for gift acceptance to ensure churches have covered their bases for when large and/or unforeseen gifts are offered. Bishop Ruben Saenz Jr. praised the work of Christopher and Slaughter in his introduction. “This is an important part of our work, to be the financial leaders of the church,” Bishop Saenz said. At the conclusion of the two-and-a-half-day event, the bishop preached about a hopeful future for the church using the story from the gospel of Mark about the calling of the first disciples of Jesus. Video from the Ask Us Anything segment.